Functionally as good as any .22 trail revolver ever made, the Model 317's excellent sight system and light weight make it the best of the best. While the author's beloved Model 63 holds a place of honor in his heart, the excellent Model 317 has all but replaced it on his hip! 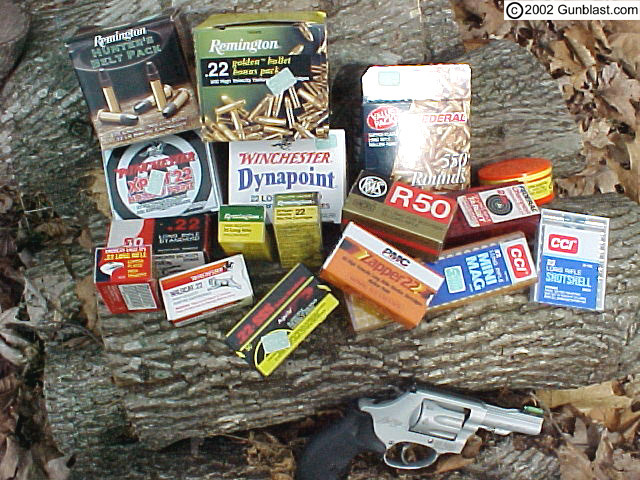 Author used a wide variety of .22 Rimfire ammunition in testing the Model 317. 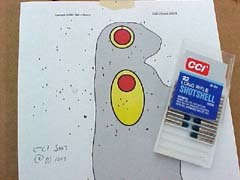 CCI's .22 Shotshell cartridges patterned very well from the little S&W's 3-1/2" barrel. 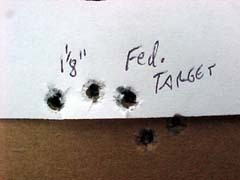 Federal's Champion target loads turned in the best accuracy performance, with 1-1/8" groups being the norm for this load. 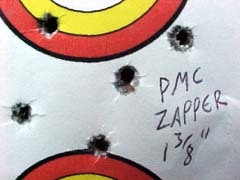 PMC's Zapper loads proved to be excellent performers in the Model 317, with accuracy nearly matching the Federal target loads coupled with above-average velocity from the 3-1/2" barrel. 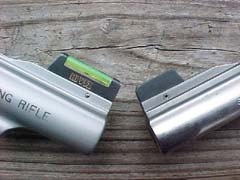 The front sight of the Model 317 (left) is a much better unit than the original stainless ramp sight with red insert of the Model 63. 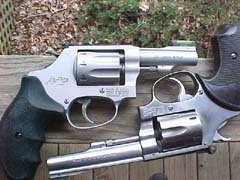 Jeff's favorite Model 63 (right) sports a custom front sight by Dave Clements. As most shooters are aware, Smith & Wesson Firearms has undergone major changes in the last few months. The changes reflect a new and improved attitude in the leadership of this corporation, due to the recent change in ownership. 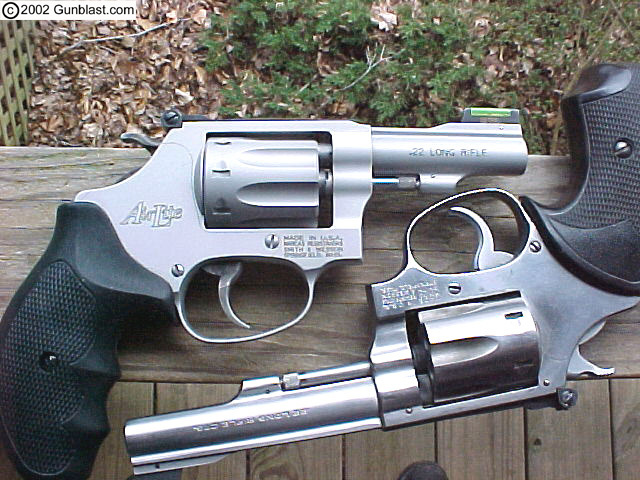 S&W is now, once again, American owned. Smith & Wesson has a new leader, America has a new leader, and things are looking brighter for both. 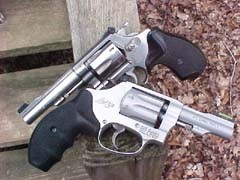 As a result of the good news of a change in ownership, Gunblast.com has recently been testing a nice little Smith & Wesson revolver which is the subject of this article. 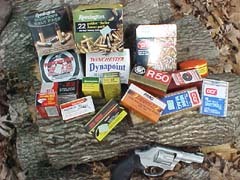 Most readers of Gunblast.com are aware of my affinity for Smith & Wesson rimfire revolvers in general, and the stainless little model 63 .22/32 Kit Gun in particular (see Jeff's article on the Model 63 at Little Big Gun). 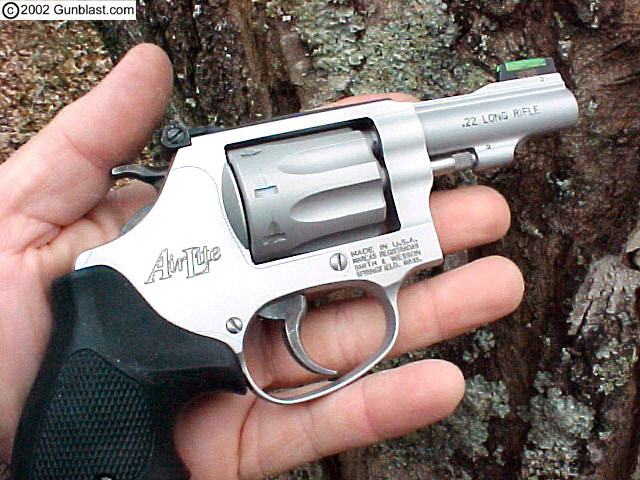 The little 63 is one of my all-time favorite revolvers, but has been out of production for several years. The subject of this article, the Model 317, is Smith’s replacement for the model 63. As much as I bemoan the demise of the model 63, the 317 may well be a worthy replacement...but it has very big shoes to fill. As you will notice in the photos, I use my old model 63 as a comparison in judging every attribute of the newer model 317. The 317 is handy little rimfire, having a three and one-half inch barrel, adjustable sights, an eight-shot capacity, and a comfortable grip. It is a bit shorter and much lighter than my old 63. The 317 weighs just under 12 ounces in the Kit Gun configuration. The 63 weighs twice as much. The weight savings are due to using aluminum in the 317, along with other design features that shave a bit of weight by carefully reshaping non-critical parts. The 317 has an aluminum frame and cylinder, and an aluminum barrel with a stainless liner. These changes result in a revolver that can ride un-noticed in a pocket or holster until needed. The model 63 was never a burden to carry, but the 317 Kit Gun is noticeably lighter and easier to carry. 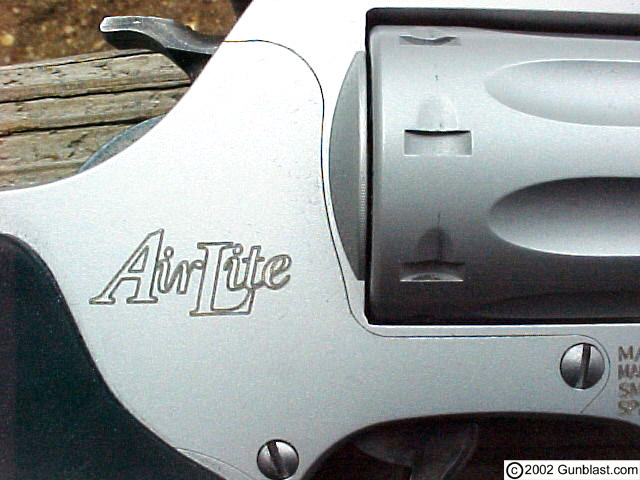 Both the double-action and single-action trigger pulls were excellent on the 317. The double-action pull has that smooth, even feel that is characteristic of most Smith & Wesson revolvers. The single-action pull is crisp and breaks at about three pounds. The sights on the 317 consist of a fully-adjustable V-notch rear and a green high-visibility front. I found the sight picture very conducive to quick shooting in all but total darkness. 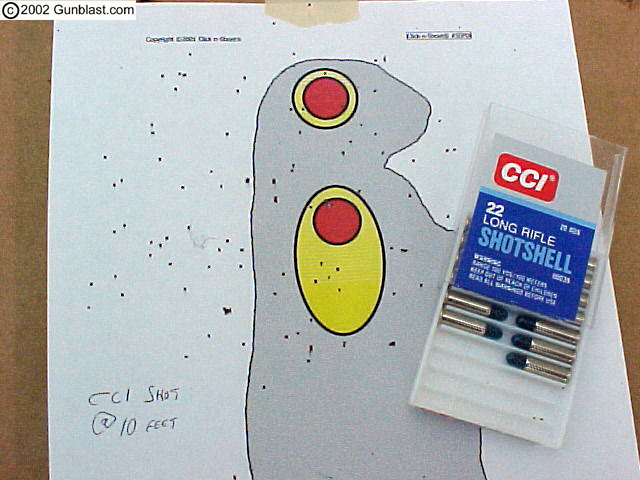 Placing the green dot optically into the notch and the target just above the dot resulted in a sight picture that made quick plinking and target shooting possible. The front sight on my model 63 was quite possibly the worst ever devised for accurate shooting. It came from the factory equipped with a stainless ramp with red plastic insert, which seemed to disappear in bright sunlight. I had David Clements (www.clementscustomguns.com) replace the sight with a blued and pinned-in-place front post that is a great improvement over the original. The front sight on the 317 is an improvement over the 63, and is also pinned in place, rendering it easily replaceable if needed. The handy little Smith 317 has an eight-shot capacity cylinder which locks securely in place at the rear into the frame and also at the front of the ejector rod. 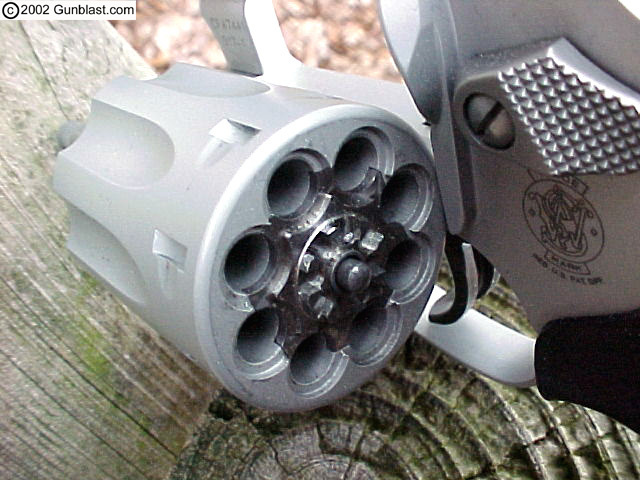 The revolver has a very tight barrel / cylinder gap, resulting in a minimum loss of velocity at that juncture. The 317 was tested with a variety of .22 Long Rifle ammo, with the resulting velocities listed below. As expected, the hyper-velocity Yellow Jackets, Zappers, and Spitfires turned in the better velocities, but all ammo tested clocked decent speeds from the three and one-half inch barrel. Even the 60 grain Aguila sub-sonic averaged over 700 feet-per-second. Most five shot groups fired at twenty-one yards averaged between two and one-half to three inches, which is better than I expected for such a light weight revolver, but the Federal Champion and PMC Zapper ammo turned in the best performance, with groups of one and one-eighth and one and three-eighths inches, respectively. After the accuracy tests were complete, I fired several hundred rounds of various Long Rifle ammo through the little Smith, with never a malfunction of any kind. 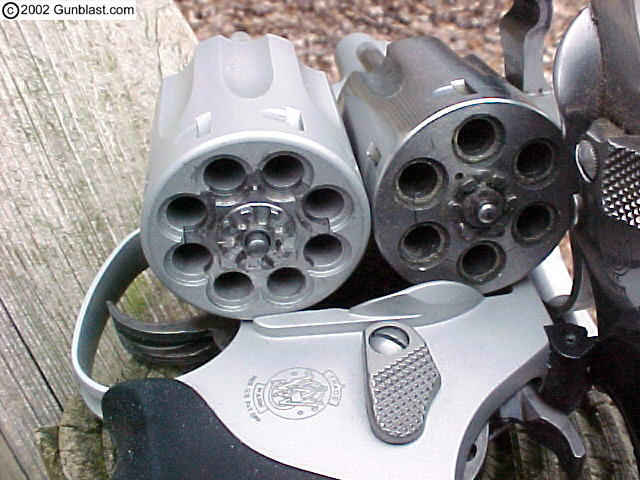 All ammo tested fired and ejected without a hitch. The ejector rod spit all eight cases clear of the cylinder each time. The little gun became warm to the touch at times, but never balked at firing or functioning throughout the test. The 317 Kit Gun is American made, by an American company, that is committed to producing a quality product. For a light, handy, reliable, and accurate trail gun, I recommend it. Smith & Wesson's Model 317 "Kit Gun" is a very nice updating of the venerable "Kit Gun" design. 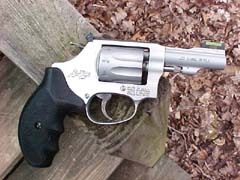 The Model 317 compares very favorably to the author's favorite Model 63 "Kit Gun", which is the benchmark against which Jeff judges all .22 revolvers. The Model 317 achieves a very packable 12-ounce weight by use of an aluminum alloy frame, 8-shot cylinder, and barrel (with stainless liner). 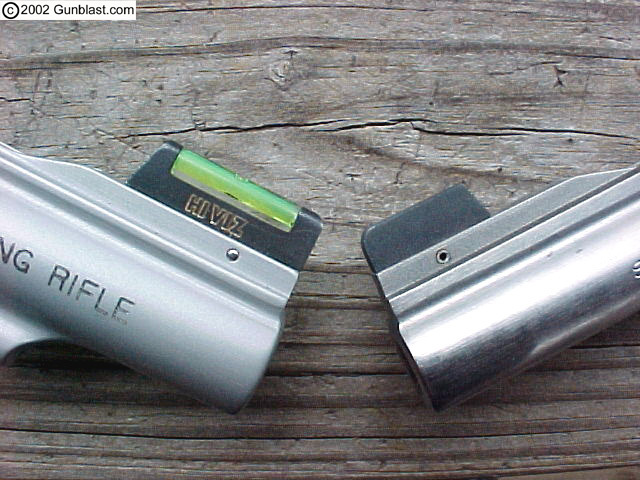 The Model 317's 8-shot aluminum cylinder alongside the Model 63's 6-shot stainless steel cylinder. 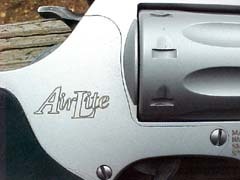 Extensive use of aluminum alloy in the Model 317 results in a revolver with half the weight of the venerable Model 63. 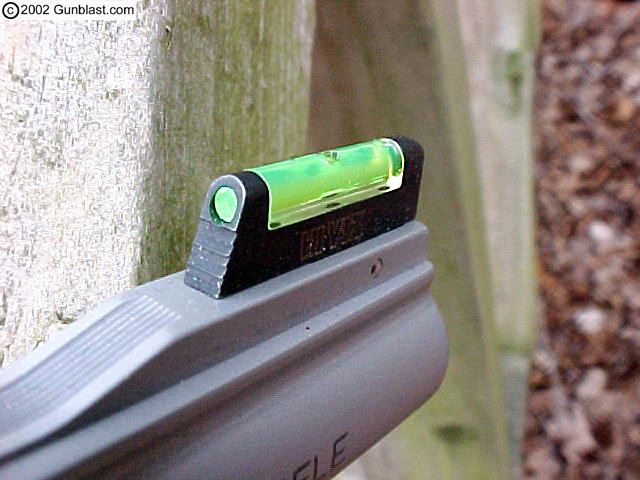 High-visibility green front sight insert is a valuable aid to low-light shooting.